Know forces (pushes and pulls) are interactions between two objects and be able to identify types of forces between objects by the way in which two objects interact. A force is a push or pull upon an object resulting from the object's interaction with another object. Whenever there is an interaction between two objects, there is a force upon each of the objects. Forces only exist as a result of an interaction. Attractive (toward each other) force between two objects with mass. For objects on earth, the force of gravity acts between the object and the earth. This force is by definition the object’s weight and it acts on the object toward the center of the earth. Resistive force between two surfaces when surfaces they rub together. It opposes the motion of an object. For example, if a book slides across the surface of a desk, then the desk exerts a friction force in the opposite direction of its motion. Friction depends upon the type of each surface and how firmly they are pressed together. Force exerted between compressed or stretched spring and an object attached to it. The spring force acts toward restoring the spring to its unstretched or uncompressed length (equilibrium). Therefore, it acts opposite the direction of the stretch/compression. Support force exerted between two surfaces that are in contact preventing them from passing through each other. Unlike friction, a normal force always acts perpendicular to (out of) the surface. As an example, if a book is resting on the table, the table exerts an upward force on the book to support its weight and prevent it from falling. A normal force could also be exerted horizontally, for example when a person leans against a vertical wall. Force applied between an object and a person/object consciously and directly pushing/pulling it. Push or pull transmitted through a string, rope, cable, or wire, directed along the wire. Attractive or repulsive force between electrical charges. Attractive or repulsive force between magnetic poles. Force exerted between a fluid and an object immersed in the fluid. Pushes upward on the object. Special type of frictional force that acts upon between an object and the air it travels through, opposing the motion of the object. Most simply, a system is a group of objects. A system is something we can decide, so choosing wisely is very important. External forces are forces that act between an object in the system and an object outside the system. Two forces between the same two objects need two lines! Each force acting on object of interest is represented as an arrow coming from the dot, in the direction the force acts on the object. 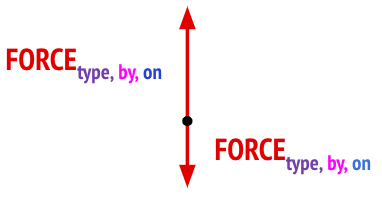 Vectors (and forces) are sometimes represented as arrows. The net force [Fnet or ΣF] is the vector sum of all forces acting on an object. Balanced forces = there is no net force. There is as much force up as down, left as right. Unbalanced forces = there is a net force. There is more force up or down, and/or left or right. Balanced or unbalanced? What is the net force?